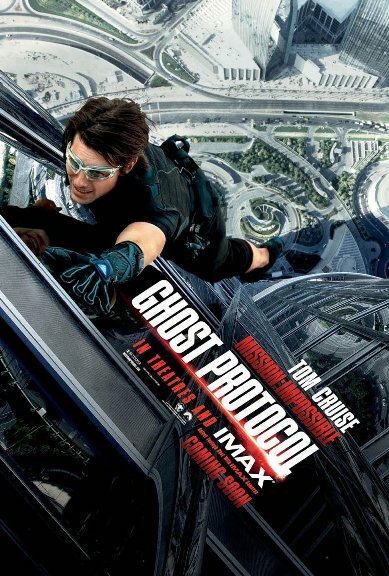 The Mission Impossible franchise had been going downhill ever since Brian De Palma made the stylish and hugely entertaining first part, so much so that I was left wondering what made Tom Cruise even willing to go ahead with the third part which arguably represented the lowest point of the franchise. Hence, I went to watch the latest installment with much trepidation; fortunately, the curve did change its trajectory with this one. In fact, one might even say that this would provide the franchise a much needed shot in the arm, and the fact that it has been more or less accepted by majority of the movie-going populace means that we might expect a fifth part sooner rather than later. Brad Bird, having made such delectable animation films as Ratatouille, is at the helm of a live-action feature film for the first time with this larger-than-life action thriller. In an era when spy thrillers are becoming less and less slick and gadget-obsessed, and more and more gritty and realistic – hell, even the Bond series has been moving in that direction over the last couple of films – Team M.I. decided to remain anachronistic by not just being on the other end of the spectrum, but also by upping the ante in terms of spectacular stunts, loads of special effects and jaw-dropping gadgetry. The globe-trotting film, which starts off at Budapest, and moves to Mumbai via Moscow and Dubai, is a classic example of “all style, and zero substance”, but it’s a darn entertaining ride all through despite that. It was fun seeing Ethan Hunt (Tom Cruise) pulling off yet another audacious mission, and in the process averting nuclear catastrophe, though the utter ridiculousness of the proceedings ensured it was a vacuous experience for most parts. Hollywood’s love for sequels has caught up with Bollywood for sometime now; consequently, its sequel had been on the cards right from when Farhan Akhtar’s remake of Don became such a popular hit with Hindi cine-goers. Though some amount of continuity has been included in the plot, and the three principal leads from the earlier movie, viz. Shahrukh Khan, Priyanka Chopra and Boman Irani, have reprised their roles, the second part has a different storyline altogether, thus making it a standalone film. If you’ve watched some amount of American blockbusters, you’d have a sense of déjà vu quite regularly while watching it – after all, it is a mash-up of sorts of such enormously popular fares as the Mission Impossible franchise, the Bond movies, and the numerous heist films that Hollywood dishes us with at regular intervals. Add Shahrukh’s incessant swagger, and hyper-stylization (glossy cinematography, kinetic narrative, plethora of cameras for each shot, over-editing, dollops of coolness quotient, a series of dramatic moments, loud music, the characters speaking only movie-talk, etc. ), and you have more or less a picture of Don 2. The movie suffers from being over-long; a less elaborate plot and a crisper length would have ensured that interest doesn’t start flagging by the time we’re into its final quarter. It wasn’t a boring ride per se – in fact, parts of it were entertaining; but on the whole it was rather insipid and forgettable. Ritwik Ghatak was forever haunted by the Partition of 1947, and that led the maverick filmmaker to compose his magnum opus which is usually referred to as ‘Partition Trilogy’. 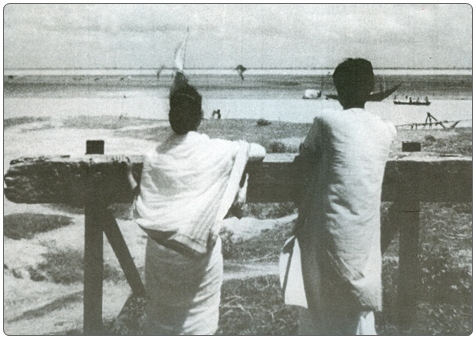 Komal Gandhar, the title of which was borrowed from a Tagore poem, was the second edition of this famed trilogy (it was preceded by Meghe Dhaka Tara and followed by Subarnarekha). The film, which was said to be closest to the director’s heart, had strong autobiographical touches as it had as its focus two rival theatre groups belonging to the IPTA (Indian People’s Theatre Association) movement of which Ghatak too had been an active member. The principal protagonists of this layered take on trampled dreams, love, and shared passion for the stage, were Bhrigu (Abinash Bannerjee), the taciturn leader of one of the groups, and Anusuya (Supriya Choudhury), a member of the rival group who jumps ship when her attempts at bridging the two are sabotaged. The complex relationship that brews between them are juxtaposed against the dynamic kinship that exists between the group members; a bit of theatricality deliberately infused into the acting gave it an interesting touch, while dashes of humour in the script made the tragic tone even more poignant. It also boasted of a great score - I found the opening song extremely haunting. Though this remains as a rare Ghatak films to end on a seemingly happy note, its sociocultural commentary and undertones made for a challenging, albeit thoroughly engrossing, viewing. The scene where a tracking shot, from the POV of an invisible train, ends on the Indian side of River Padma, remains one of the most powerful sequences in the history of Indian cinema. 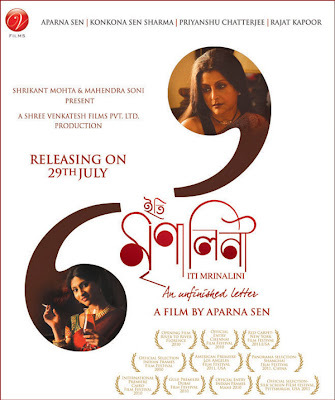 Iti Mrinalini, Aparna Sen’s latest offering, is the story of an ageing actress who has decided to end her life, and while she contemplates on the life that she has led and the various moments that she has lived, elaborate flashbacks show us her entry into the film industry, her stardom, her relationships and her personal tragedies. The film’s premise, therefore, was not just worthy of attention, but brilliant too. Unfortunately, the director, who is decidedly not in the best phase as a filmmaker, failed to transform the arresting story into an equally captivating script. A number of interesting elements were not developed enough (the role and subsequent death of her college-life fiancé, for instance, should have been better explored), the proceedings regularly alternated between soppiness and highbrow philosophy – both of which should have been kept at a bare minimum, and though the character dynamics were reasonably well explored, the arcs for most of the characters were not fully realized. This is not to say that the film is bad, as there are some aspects about it which are praiseworthy, only that it is disappointing. The cast has done a good job, especially Kankona Sen Sharma as the young Mrinalini, Rajat Kapoor as a famous filmmaker who has Mrinalini as his mistress, and Priyanshu Chatterjee as a newcomer who manages to get the now-retired Mrinalini back in front of the camera. The lilting score and the opulence in terms of the set-design and costumes made the film worthy of a watch, but the rather bland script and poor characterizations ensured it remains in the realm of self-indulgent melodramas. p.s. And there goes my 6ooth review for Cinemascope. Cheers! George Clooney’s latest offering as a director is a taut political thriller and a deeply cynical look at what goes on behind the scenes during US Presidential campaigning. 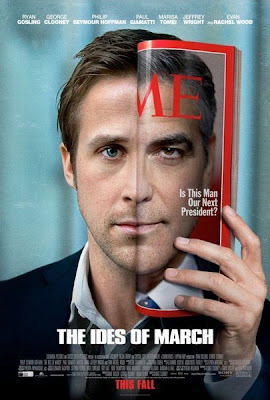 The Ides of March, adapted from a popular play, takes place during the Democratic nomination process where Governor Mike Morris (Clooney) is in a neck-to-neck fight with his opponent. He’s seen as a clean person with impeccable integrity, but even he has a skeleton in his closet – in the form of a pretty young intern (Evan Rachel Wood). The theme propounded by this underhanded morality tale has been brought forth through the character of Stephen Myers (Ryan Gosling), an exceptionally talented press secretary, who learns some brutal truths about politics the hard way. This is a solid film that keeps one thoroughly captivated over its length, thanks to the breathtaking pace at which the story moves forward, the relentlessly moodiness, and the fine performances by its talented ensemble cast. Gosling and Clooney were good in their well-crafted characters, as were such powerhouse performers as Phillip Seymour Hoffman and Paul Giamatti as the campaign managers for Morris and his opponent, respectively; even Marisa Tomei shone as an opportunistic reporter. The movie is not without its flaws though. The journey of Myers from idealism to lost innocence, for instance, took place too quickly, thus making the impact of the transformation lesser than what could have been achieved had some more time and effort been devoted to it through the script. Also, some of the moments could have been handled with softer hands. But those apart, this is yet another competent and admirable directorial venture by Clooney.